With the turn of the season All Hallows Eve is upon us and with it comes a certain kind of morbid celebration. For a month we revel in our fragile humanity and embrace horror and the fear it ignites within us. Which, as it turns out, is perfect because manga as a genre holds a great love for the disturbing and obscene. 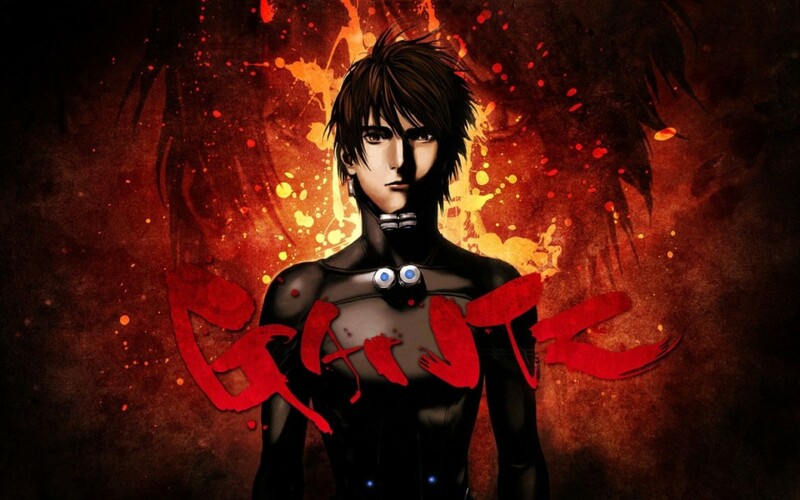 From the gore and insanity of Berserk to the psychological trauma of Real, this column has gone a long way to show that nothing is off limits or out of bounds when it comes to Japanese storytelling. Manga uses this artistic freedom to create adventure and excitement and joy. Now imagine for a second – what would horror look like when crafted with the same unadulterated care? A world where fear is allowed to grow free and unfettered by taboo, and the author’s only limit is his ink and imagination? Can you imagine? 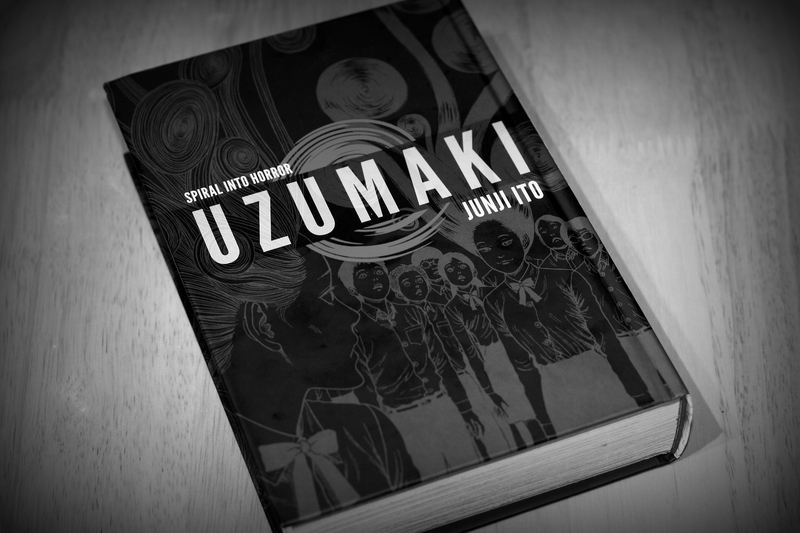 Don’t worry, it has already been done, and its name is Uzumaki. 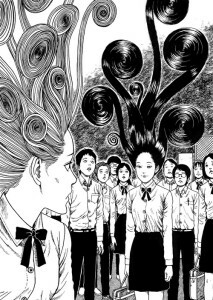 Uzumaki by Junji Ito is to manga what H.P. Lovecraft’s The Dunwich Horror is to fiction- genre defining. 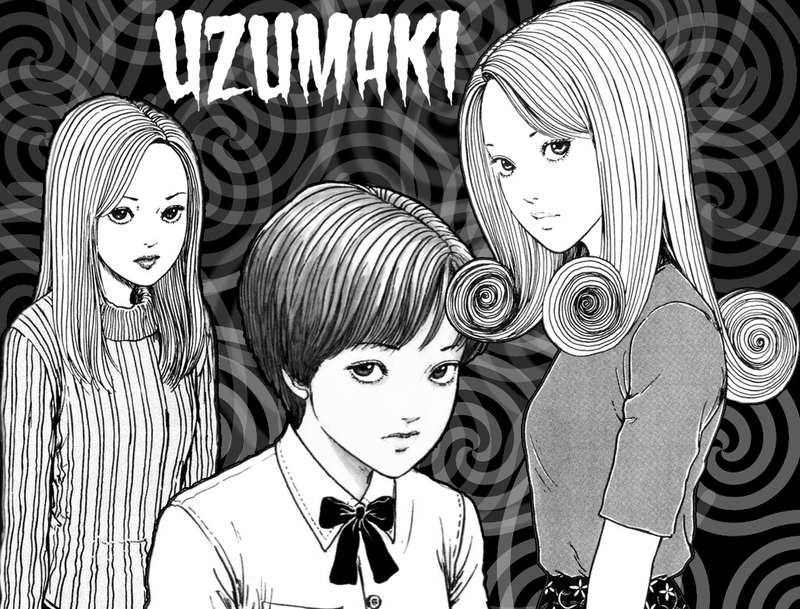 Uzumaki was nominated for an Eisner in “Best U.S. Edition of Foreign Material” in 2003 and has since been included in nearly every top manga and horror list to date. 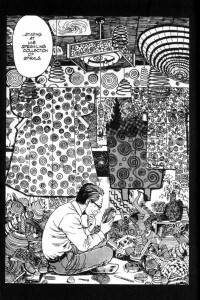 Ito, much like Lovecraft in his heyday, sets a standard with the quality and clarity of his work. 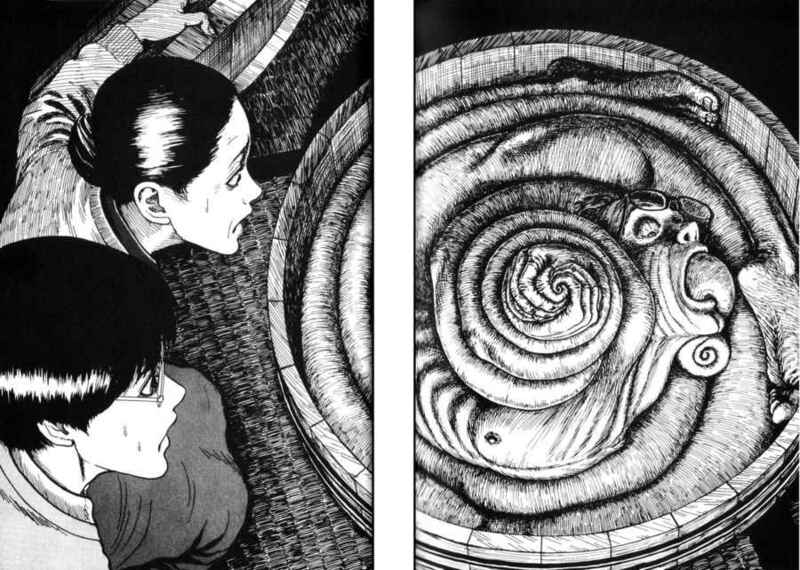 Uzumaki acts as a link between the abstract tent-pole concepts of written horror and the physicality of artwork on a page. He breathes madness into the world that is as horrific as it is mesmerizing and imersive. 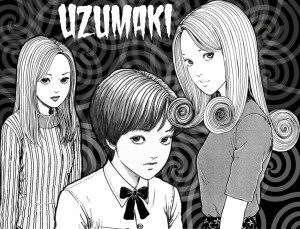 Uzumaki seamlessly blends the sublime and terrible with the tortured tale of a small town plagued by a great evil called The Curse of Spirals. The story follows a young girl named Kirie Goshima who lives in the isolated coastal town of Kurozucho. The background art is heavy with shading while the characters exhibit neat simple lines. 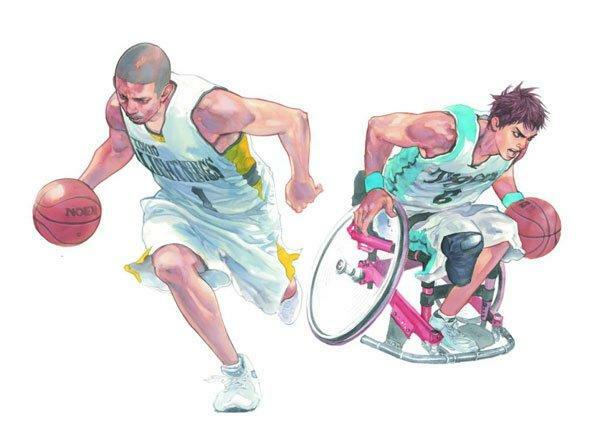 The foundation of Ito’s artwork is its realism. 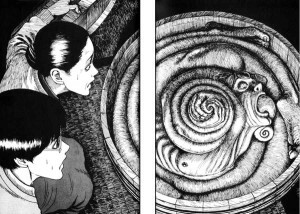 From the onset of the story the reader is made aware that something terrible has already happened and Uzumaki is told as a collection of loosely related stories that tell a larger tale of disaster. The first short story spans two chapters and follows Kirie’s interaction with her boyfriend, Shuichi, and his family. 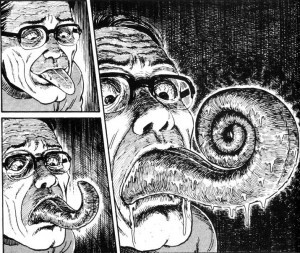 Shuichi’s father has become obsessed with spirals. He has not only quit his job over his new obsession, but his behavior has begun to change as well. Shuichi tells Kirie that his father’s eyes have begun to spin as his love of spirals deepens. He tells her that each of his eyes rotates in a separate direction, following the path of a spiral. In these moments Ito’s artwork does the talking. The words disappear and for several panels, Ito leaves the camera work to the genius of his pen. His realistic style finds a way of grounding the absurd in ways that are truly hard to look at. The eyeball scene in particular is rendered with such authentic detail that the horror of the situation is palpable. The bulge of veins across a cornea mixed with the father’s smile of self-satisfaction and ecstasy, it’s enough to seriously disturb. The scene, to put it lightly, is a masterpiece. The Curse of Spirals does not stop with Shuichi’s father; it spreads and festers across all aspects of Kurozucho life. From a student who is slowly transforming into a snail, to a crematorium whose smoke stacks spill ashes in spirals across the sky. 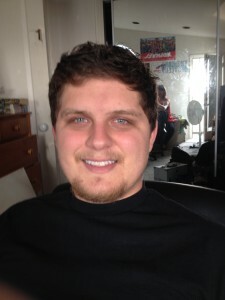 Over the span of a dozen or so stories Ito manages to tackle a wide range of topics and ideas. One of my favorites centers around a girl whose personality resembles that of a spiral. She seeks attention, craves the acceptance and gaze of all those around her. To match this need her hair begins to grow in great spirals. The curls refuse to be cut and instead function like Medusa’s crown of snakes. As the story unfolds Ito manages to find the perfect artistic solutions to otherwise abstract and lofty ideas. The spirals stop being an object or a concept. They step out onto the page and inhabit the neat lines and heavy shadows. They have a personality and a face in the death and misery they sow. By the end of the story the girl is simply a vessel for the spirals to interact with the world around them. They take on an entire character life of their own. With every new beginning Kirie and Shuichi endure the evolution and expansion of The Spiral Curse. Much like Jason from Friday the Thirteenth or Freddy from Nightmare on Elm Street, the spirals begin to inhabit the active role of the antagonist. Reading, I began to dread their return and shudder at the consequences of their arrival. Much like any of the chase scenes from the aforementioned films, the spirals had a way of putting me on the edge of my seat. My breath would fall completely silent for pages at a time as the spirals brought calamity onto unsuspecting townsfolk. I do not use the word calamity lightly, and in this case it’s an understatement. Coupled with his sheer artistic talent, Ito has a nearly inexhaustible storehouse of hellish ends and diabolical means of torture. Every single one of his gruesome drawings is unique, original, and cruel. Take a moment and think about that. There are blockbuster Hollywood franchises that revolve around finding unique ways of killing people and still struggle to tell a story. Ito never skips a beat or a scream and for that we can all be thankful. 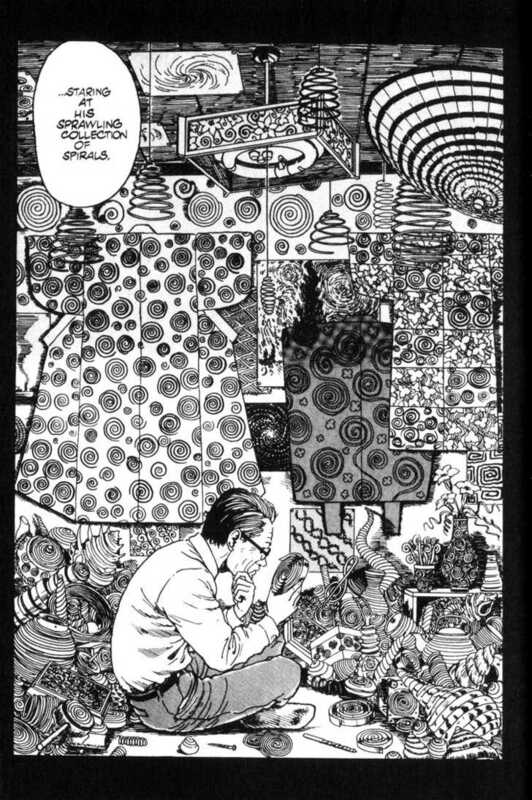 Uzumaki is more than a single-minded quest for misery. It is a fusion of sublime inspired horror and artwork fit for the canvas. Like Edvard Munch’s Scream,Ito finds physicality in the storm of emotion and ideas around him. Like the spirals his story is so transfixed by, he presents the reader with a narrative so gruesome and bizarre that we have no choice but to follow it through to conclusion. Unlike Lovecraft, who found value in the unimaginable and sublime, Ito finds his gold by giving us a photograph. As a reader we inhabit his spiral filled world and with each passing story, fall deeper into his spell. The result of his hard work- a masterwork of horror and a unforgettable nightmare. A dream that I honestly would not mind repeating.